I am a network engineer by trade and manage a nationwide network with data centers in five states. I try to maintain a separation between work and home life so I only take select projects on the side. Mostly what you find on this blog will be related to fun, relaxing and non-IT related projects. What do I consult on you ask? Currently nothing! However, everyone will tell you I am full of unsolicited opinions. I throw it out there and if you use it, GREAT! The frogs are out doing what frogs do. You can see some if you zoom in. Wish they were free of debris but the fruit tree above the waterfall is in full bloom. Still a pretty green cover on the pond. Hard work pays off if you can wait patiently all winter and spring. I've been looking around for low or no cost way to grow my food. After nearly 30 years in apartments and never having space to really garden I started using Tower Gardens. 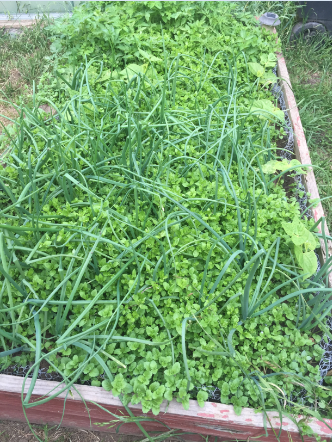 Now that I live in a house with a yard I am gardening in the landlord's old rotting raised beds fighting weeds, gophers, and other critters including my dogs and cats. The extra green around my onions is a local ground cover and a "cover crop" if you will. It looks like weeds but they are shading out vorse weeds so the pretty green stays. However, I have to come up with a way to use my pond water and I want some new pretty raised beds to grow my next crop this summer. Introducing the Used Pallet raised bed gardens. 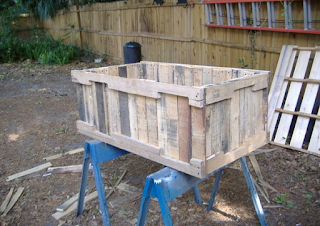 This image is from the Indestructible "Planter from pallets, no nail pull method"
It is really an awesome and totally doable project that my Dad and I can work on. Maybe people would pay for these and we could turn a profit. Really the only cost would be the nails/screws. I figure with a small modification of the design we can add a shelf on the inside and some plumbing we would be able to make a bell siphon ebb and flow hydroponic grow bed. Those things could pull in a good chunk of change if we got a working model. My dream is to pump water from my pond into the grow bed which filters the water and returns it back to the pond. I am going to get at least one working this year. And I know I can sell that system.